It's 1933 and she is back in her light- filled flat in Berlin. Hans is making caipirinhas, snow falls outside the kitchen window, and Hitler is making his first speech as Chancellor of Germany. Her life and those of her tight-knit group of friends are about to change beyond all recognition. Having dedicated themselves to resisting the Nazi's rise, they have become hunted outlaws overnight. Fleeing the country, Ruth and Hans find refuge in a basement flat in Bloomsbury, but inspired by Ruth's fearless cousin Dora, they defy the conditions of their visas and risk being sent back to Germany in order continue their dangerous resistance work. But with each breathtaking act of courage and every person that they trust, they cannot help but risk betrayal and deceit. And then, one day, they face the chilling realisation that Hitler's reach extends much further than they had thought, even to London itself. 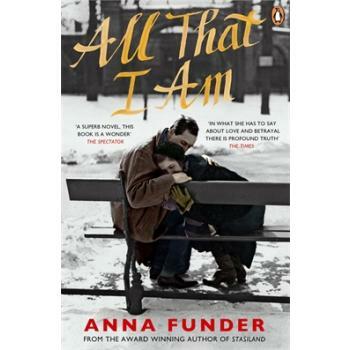 Inspiring, tragic and based on real events, All That I Am is a masterful and devastating novel of bravery and betrayal, of the risks and sacrifices that people endure to protect their beliefs and of discovering remarkable heroism hidden in the most unexpected of places.